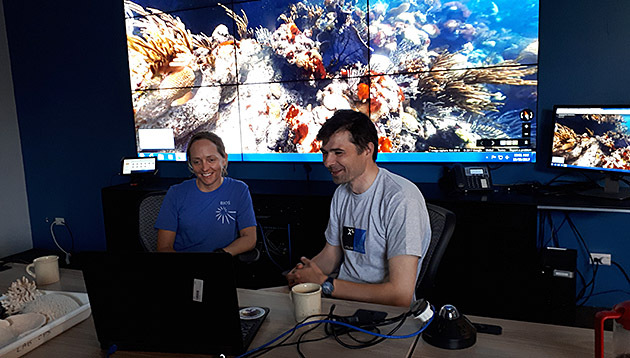 BIOS marine biologist and ecologist Samantha de Putron (left) joined Jamie Buchanan-Dunlop, co-founder of Digital Explorer, for a lesson on coral reefs with students at an international location. The nearly two-week, web-based event reached more than 3,700 students from a variety of countries. A group of BIOS researchers and educators had the opportunity to share their marine science knowledge and experience with nearly 10,000 young people around the world this fall, all without ever stepping foot off Bermuda. From October 30 through November 10, 2017, the Bermuda-based reinsurance company XL Catlin and Digital Explorer, science education specialists based in the U.K., teamed up to run the “XL Catlin Coral Live” program. The event was part of XL Catlin’s Ocean Education initiative, which aims to increase ocean literacy using data and resources from the Catlin Arctic Survey, XL Catlin Seaview Survey, and the XL Catlin Deep Ocean Survey. The goal of the XL Catlin Coral Live event was to provide an educational legacy for science expeditions and research programs by connecting students and teachers globally with a fascinating habitat and the marine scientists and explorers striving to conserve it, said Jamie Buchanan-Dunlop, co-founder of Digital Explorer. During BIOS educator Kaitlin Noyes’ session, she touched on a range of topics including the link between human activities and recent changes in ocean temperature and chemistry and the evolution of coral lineages throughout Earth’s history. She even gave a demonstration of SCUBA diving gear. “It was wonderful to get questions from all over the world, and exciting to have no idea what the next question was going to be,” Noyes said. The web-based interactive event tapped scientists and educators from BIOS and the Bermuda Aquarium, Museum, and Zoo (BAMZ) to participate in live YouTube broadcasts. During these broadcasts classes of students spoke to experts, learned more about Bermuda’s coral reef ecosystem, and heard from practicing scientists about their respective education and career paths. During the two-week event, Buchanan-Dunlop, also a science educator, conducted 79 one-on-one presentations with individual classrooms via Google Hangouts, reaching more than 3,700 students from countries around the world, including Ukraine, Portugal, the U.K., and the U.S.. These sessions allowed Buchanan-Dunlop to give students a deeper look at some of the research taking place at BIOS, as well as “behind-the-scenes” virtual tours of BIOS labs and the Institute’s research vessel Atlantic Explorer. In addition to Noyes, three other BIOS faculty and staff took part in the Coral Live event: Samantha de Putron, marine biologist and ecologist; Chris Flook, small boats and docks supervisor, and former collector of marine specimens for BAMZ; and Tim Noyes, research specialist in the Coral Reef Ecology and Optics Lab. With Buchanan-Dunlop as moderator, each BIOS representative was featured in a 45-minute live YouTube session, with an average of 12 classrooms participating in each session. For her part, de Putron offered participants a broader understanding of coral reefs, discussing the differences between hard and soft coral, coral reproduction, and how the Gulf Stream’s warm waters support Bermuda’s reef ecosystem. As a mid-career scientist, she was also able to provide students with a wealth of information about how to pursue a career in ocean science. Although the event is officially concluded, the YouTube broadcasts can still be viewed online, and educator resources are still available for download from the Digital Explorer website.